and services to all our customers around the world. service to our customers and their needs. We have been in the business since the birth of the pre-paid calling card in the USA. Join the millions around the world who choose our products to save on all their calling needs. We provide complete custom voice solutions designed to prosper any size business. Since 1999, Universal Calling Inc. has been delivering unparalleled quality and reliability within the prepaid telecommunications industry. With more than millions of products sold, Universal Calling Inc. is one of the largest online wholesalers and master distributors of prepaid telecommunications. Our ProductsJoin the millions around the world who choose our products to save on all their calling needs. With more than 15.4 million cards have been delivered since 1999. Being at the forefront of the prepaid telecommunication industry, CallingCards.com has established itself as an innovative leader. 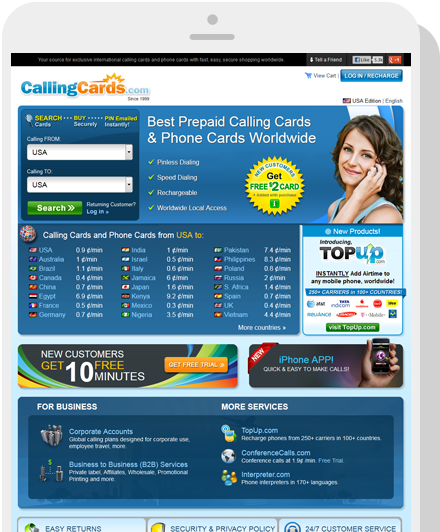 Callingcards.com provides the best prepaid calling cards & phone Cards worldwide. With features like Pinless Dialing, Speed Dialing, Rechargeability and Worldwide Local Access, it's no wonder we're the leader in prepaid calling card services. Host small to large global meetings with up to 10,000 people! Businesses around the world reduce their operational costs by up to 90% from traditional conferencing methods. Conference Call Anyone, Anywhere, Anytime. It's like having the world at your fingertips. Get unparalleled quality and dependability for all your telephone and web conferencing needs. 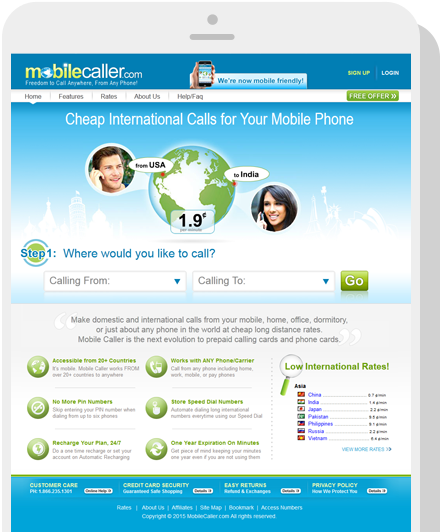 Cheap International Calls for Your Mobile Phone. Make domestic and international calls from your mobile, home, office, dormitory, or just about any phone in the world at cheap long distance rates. Mobile Caller is the next evolution to prepaid calling cards and phone cards. Amazing Low Rates! Call 100+ countries starting at a low cost of just 1¢ per minute! For residential and businesses, get the ability to conveniently make calls without ever entering a pin number from up to 6 phone lines. A Global Calling Services for Business. An international calling plan designed specifically for corporations! Cut long distance phone expenses up to 90% by using us from landlines and cell phones worldwide. A simple and cost-effective way to eliminate language barriers! Our skilled phone interpreters are always available to assist you with international communication needs in over 170 languages. 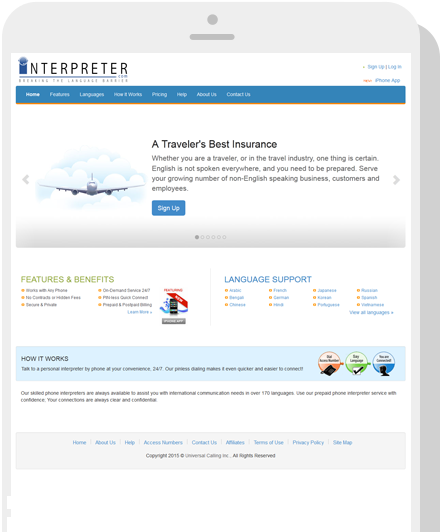 Use our prepaid phone interpreter service with confidence; Your connections are always clear and confidential. Connect to a personal interpreter by phone at your convenience, 24/7. Our pinless service makes it quick and easy to connect to your interpreter! No Hidden Fees. Same Rates 24/7, All Year. Call the world at the best rates from the United Kingdom! At PhoneCards.co.uk you can find the best international phone cards to make cheap international calls! Save up to 95% on international prepaid phone cards. Phonecards.co.uk offers the best calling cards from the UK. Save up to 95% on international calls. Our prepaid phone cards work from 50 countries. Get an international phone card delivered to your email in seconds. Our prepaid calling cards offer PINless Dialing, Speed Dial, and Fast Top up! Our ServicesWe provide complete custom voice solutions designed to prosper any size business. We invite you to become a partner today and start earning immediately. Create an additional avenue of residual cash flow under your company brand. We provide a wide variety of API web services that your company can use. Help to attract a new market of customers with promotional cards. We are one of the early pioneers in electronic pin delivery via the internet. We made it easy for you to activate a card or recharge a card instantly. Integrates the processing of all major credit cards and ATM/debit/EBT cards. We can provide paper cards, or even electronic cards for your company. Premium online telecommunications resource, over 20 years in business. With an unmatched portfolio of telecommunications products and services, Universal Calling Inc. is continuing its legacy of leadership and innovation into the 21st century and beyond. Come join us. 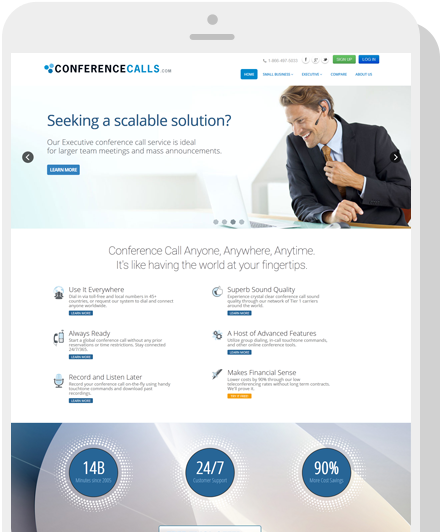 Why Pay More for Reliable Conference Calls? Low, Low Rates for International Conference Calls, Even For Prepaid. Now Mobile & Tablet Friendly! Universal Calling Inc. has been in the business since the birth of the pre-paid calling card in the USA. We sell the most reliable and dependable cards to their customers on tier one carriers, providing 100% Guarantee on all cards.